People who look after their teeth and oral health also love to play sports and sometimes even have accidents. That’s why we are here to look after your Grand Genesis emergency dentistry needs. We have an expert staff of qualified dentists who can help you and give you the proper advice about how to restore that beautiful smile after a chipped or damaged tooth temporarily changes the way you look. An abscessed tooth. Not every dental mishap that you will encounter has to do with getting hit with a puck or falling down and chipping one of your teeth. An abscessed tooth can become a problem that stems from an infection and can be serious and painful if left untreated. If you have this problem, you’re more than likely have some discomfort and swelling to go along with it and we can resolve the issue and treat the pain at the same time. A fractured or otherwise damaged tooth. Not all the injuries that you can sustain to your teeth come from sports or accidents. Sometimes repeatedly filling a damaged tooth can cause a mishap. Our expert dental professionals in Richmond Hill will be able to diagnose the problem correctly and supply you with the treatment that you need. Gum disease can become an emergency situation as well. Different types of gum disease can actually bleed and swell causing discomfort that needs to be looked after quickly. Please keep in mind that we are all about providing a variety of excellent dental care services. 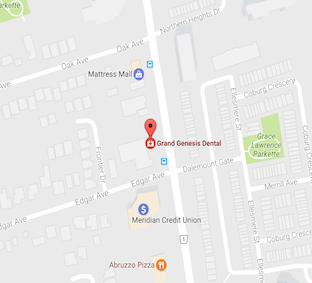 Whether you’re looking for emergency dental Grand Genesis options or cosmetic and family dentistry choices, we have what you need backed by our 20 years of experience. Care, advice and education. Those are the three elements of the family dentistry service triangle we provide for each and every one of our valued Richmond Hill patients. It doesn’t matter whether you’re looking to have your teeth aligned, whitened or whether they need to be restored back to their original brilliance, we have the techniques available and a friendly knowledgeable staff that cares. Getting in touch with us is easy and our location is convenient, accessible and has ample parking. We are always accepting new patients and are looking to add your name to our Richmond Hill family dentistry and emergency services family.